Well hello there, Charleston! Main draw action for the 2019 Volvo Car Open began on Monday with 15 first round matches on the schedule. This is one of my favourite tournaments of the year – Charleston is always a well-attended event (the stands were packed for qualifying!) with a quality field of players who clearly enjoy the relaxed vibe of the tournament. I’m hoping to blog during the week and it will be a nice distraction from another busy week at work. Read on for highlights of Monday’s action in Charleston. Playing her first match in nearly 13 months, Shelby Rogers produced a fine display to beat Evgeniya Rodina, 6-4 6-2. Rogers clearly meant business as she produced a rocket return winner for her first return of the match. Rogers was striking the ball well and constructing the points with clarity. Rogers was clinical on serve with six aces and was comfortable coming forward to close out points. Considering this was her first match in so long and with all the emotions, this was a mightily impressive display from Rogers. The 26-year-old American could barely contain her emotions during the match. Even in the warm-up, she was breathing heavily, and then was teary after winning the first set! Shelby was a wreck in the final changeover (😭😂) but her focus never wavered and she finished off the match in style. It was lovely to see how much this meant to Shelby having been on the sidelines for so long with a serious knee injury. And for it to happen at her home tournament must have been such a special moment. Shelby brought on her niece for the post-match interview (videos linked on the Instagram post below) to help her cry less… it didn’t work! Welcome back, Shelby. Belinda Bencic needed just 55 minutes to see off the Aussie qualifier, Destanee Aiava, 6-3 6-0. Bencic had one mini-stumble as she failed to serve out the first set at *5-2. Otherwise, it was a very clean and aggressive display against an erratic and subdued, Aiava. Bencic is showing improvements in all aspects of her game this year. The serve has been much more stable in 2019 and I think she has been using it very effectively, hitting big after a decent first serve. Bencic advances to the second round where she will play the American, Allie Kiick. Key to Jelena Ostapenko‘s success is keeping the winners and unforced errors even. The Latvian player managed to do that on Monday, hitting 27 winners to 27 unforced errors in a 6-1 6-4 win over Johanna Larsson. Ostapenko was aggressive, yet played with margin, as she cruised through the first set. Even when Larsson mixed things up in the decider, Ostapenko stayed mostly patient. The second serve for Ostapenko continues to be an area for concern. On this occasion, she managed to maintain a high percentage of first serves, especially throughout the second set, where she didn’t face any break points. 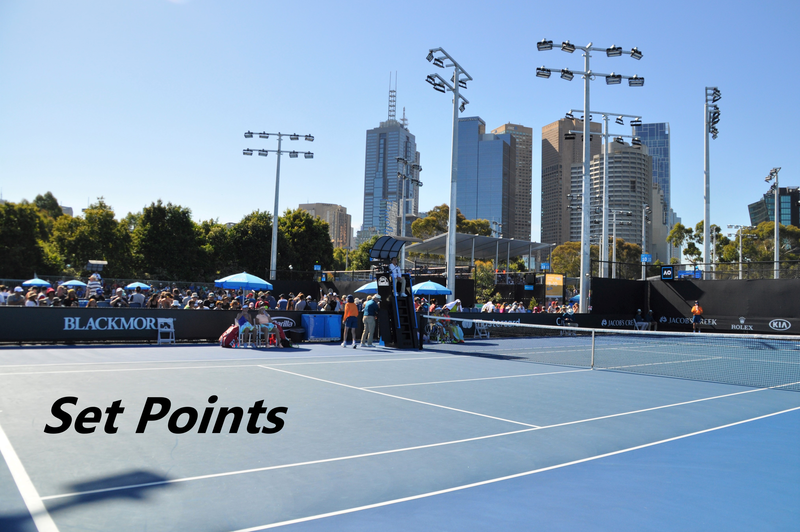 A great point linked below in the final match on the Althea Gibson Club Court between Taylor Townsend and Astra Sharma. A beautiful finish with a deft drop shot from Sharma. Loved these shots by Daniel Ward on Twitter from All-Access Hour in Charleston. Nice to hear Caroline Wozniacki is hitting with Francesca Schiavone in Charleston and getting some tactical tips for the clay. A Q&A with Kiki Bertens’s coach, Raemon Sluiter, about adjusting to the green clay of Charleston. The first round wraps up on Tuesday, as well as the first two second round matches including the top two seeds, Sloane Stephens and Kiki Bertens. My MOTD for Tuesday is second up on Stadium court featuring Petra Martic and Amanda Anisimova. I think i’d go for AA who has already racked up a win against Martic last year in Cincy. I think it will be a very interesting match. I don’t fancy an upset alert for Bertens up against Martina Trevisan. Intrigued to see how Sloane Stephens gets on against Sara Sorribes Tormo who can be a tricky customer on clay. The Spaniard thrashed Fanny Stollar in the first round, 6-0 6-3 in just 65 minutes. Stephens is 6-6 for the year and you just never know with Sloane. The Kenin-Lisicki clash, my match of the day for Monday, took agessssss to come up on the WTA TV on demand page so had to make do with the highlights last night. So so so happy for Shelby Rogers certainly well deserved! Tomljanovic and Kenin have definitely been in form and sliding under the radar! Looking forward to seeing who comes out on top here in Charleston. I’ve gone for Kenin as my champ in Draw Challenge this week! Good spot about the doubles, I guess Larsson will be more at home on the red clay.